1 (17 Nov 1942), 3(FTO), 4, 5(A), 7(LC), 8(A), 10(A), 12, 13(A), 14, 15, 16, 17, 18(LC), 19, 20(FTO), 22(AS), 23, 24, 25(LC), 26, 27, 28, 29(LC), 31, 34, 35, 36, 37, 38, 39 (21 May 1943). (A) Non credited aborted mission, (FTO) Failed to take off, (LC) Lead Crew (AS) Credited abortive sortie. For Mission dates, targets and Mission Reports, see Combat Missions. Capt Carl H. Morales (P)(OC) - An original 303rd Pilot. 25 credited combat missions. As Lead crew CoPilot with Maj Clemens K. Wurzbach (7, 18, 25, 29). As First Pilot - all other missions. Combat tour completed on 21 May 1943. 1Lt Calvin A. Swaffer (CP)(OC) - An original 303rd BG(H) CoPilot. Previously flew as a RAF PIlot. Flew on 25 credited missions: With Capt Morales (18 credited missions - 1, 4, 5(A), 8(A), 10(A), 12, 13(A), 14, 17, 22, 23, 24, 26, 27, 28, 31, 34, 35, 36, 37, 38, 39); With Capt Robert Nolan - as Tail Gunner Observer (40); Upgraded from CoPilot to Pilot. Flew 6 missions as First Pilot with 1Lt John R. Johnston as CoPilot. 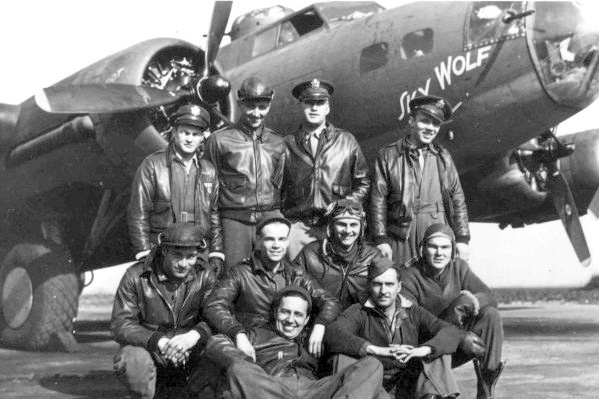 25 mission combat tour completed on 14 July 1943 when 1Lt Swaffer ditched his B-17 in the English Channel and all crew members were rescued. 1Lt William C. Hunter, Jr. (N)(OC) - Flew on 2 credited missions with the Capt Morales Crew (1, 4, 5(A) ) and removed from combat status. Replaced by 1Lt Hubert H. Miller (N). Capt Hubert E. Miller (N) - Flew on 17 credited missions with the Capt Morales crew (7(LC), 8(A), 10(A), 12, 13(A), 14, 15, 16, 17, 18(LC), 19, 22, 23, 24, 25(LC), 26, 27, 28, 29(LC), 31) Last mission flown on 17 April 1943. 1Lt Frank E. Zasadil (B)(OC) - Flew on 25 credited combat missions: With Capt Morales (24 credited missions - All of Capt Morales missions except for #7. Mission #40 flown with another Pilot. Combat tour completed on 29 May 1943. T/Sgt Francis G. Hinds (E)(OC). Flew on 25 credited combat missions - All with Capt Morales as Pilot. Combat tour completed on 21 May 1943. T/Sgt Francis J. Burns (R)(OC). Flew on 25 credited combat missions: With Capt Morales (23 credited missions - All of Capt Morales missions except for 1, 4, 10(A); With other Pilots (2 missions - 41, 42) Combat tour completed on 13 June 1943. S/Sgt Albert V. Carroll (BTG)(OC) - Flew on 23 credited combat missions: With Capt Morales (17 credited missions - 1, 4, 7, 8(A), 10(A), 12, 13(A), 14, 17, 18, 19, 22, 23, 24, 34, 35, 36, 27, 38, 39); With 1Lt John V. Lemmon (1 mission - 40), with Capt Mitchell and Col Marion - Lead crew (45); With 1Lt Robert S. O'Connor (4 missions - 42, 44, 47, 48). 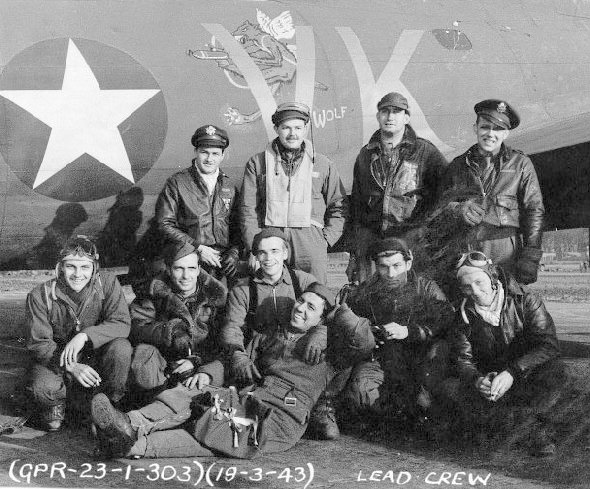 Was shot down on mission #48, 4 July 1943 to LeMans, France, in B-17F #42-5792 The Mugger (358BS) VK-I, 1Lt O'Connor (P) just before reaching the Initial Point with the No. 1 engine completely in flames. (2 KIA, 4 POW, 4 EVD). A monument was erected to the 1Lt O'Connor crew at the crash site at Malicorne, France. S/Sgt Carroll returned to Molesworth on 19 October 1943 after a successful evasion from capture. S/Sgt John E. Hill (WG)(OC). Flew on 25 credited combat missions: With Capt Morales (24 credited missions - All of Capt Morales credited missions except for #4; With 1Lt Oran T. O'Connor (1 mission - 6). Combat tour completed on 21 May 1943. S/Sgt Max W. Westfall (WG). Flew on 25 credited combat missions: With Capt Morales (22 credited missions - All of Capt Morales credited missions except for #1, 4, 16); With other Pilots (3 missions - 16, 41, 42). Combat tour completed on 13 June 1943. S/Sgt Robert C. Blake (TG)(OC). Flew on 25 credited combat missions - All with Capt Morales. Combat tour completed on 21 May 1943. (OC) Original 1Lt Carl H. Morales crewman on the overseas flight from the USA to Molesworth in October 1942. Crewmen in Crew photo at Prestwick, Scotland dated 13 Oct 1942. 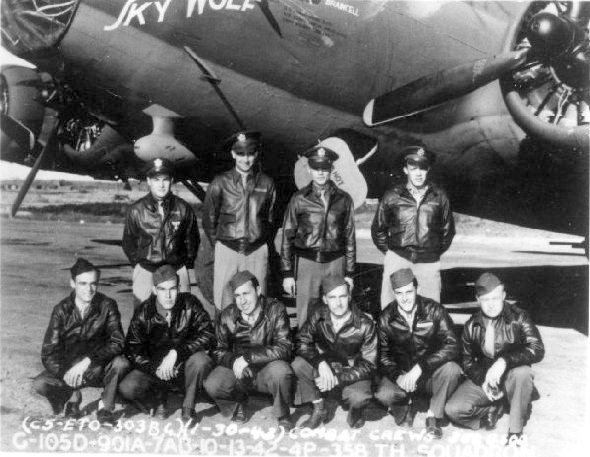 41-24562 Sky Wolf (358BS) VK-A - Twenty-two credited Capt Morales missions. 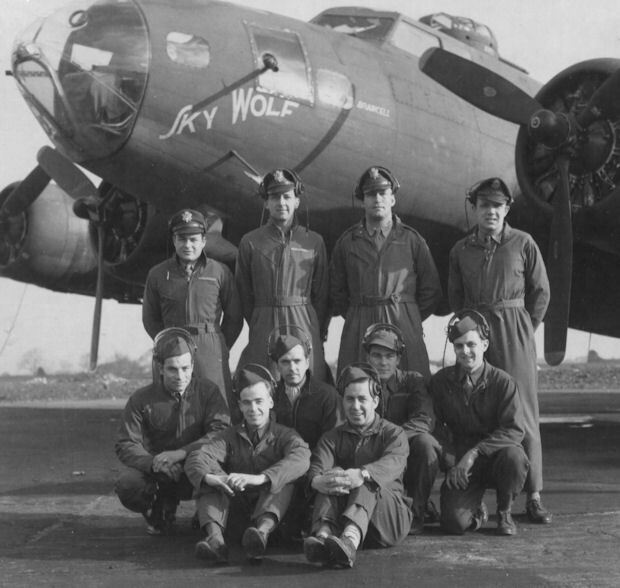 B-17 was assigned to the Capt Morales Crews in the USA and arrived at Molesworth on 24 Oct 1942.